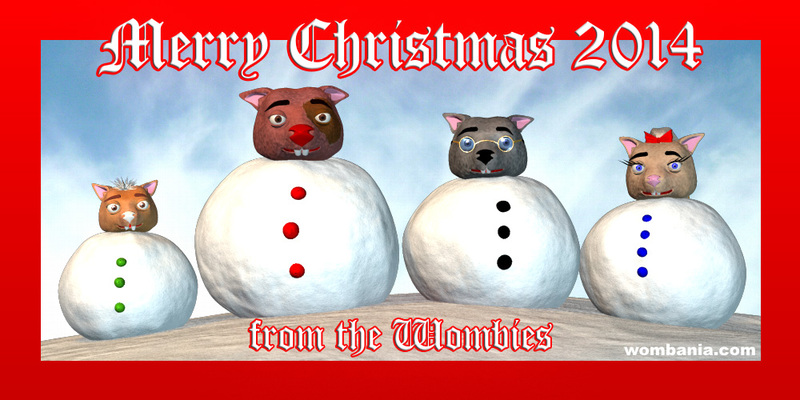 The Wombies and I wish everyone Merry Christmas and Happy Holidays! We’re taking a short break, and this will be the last cartoon post of the year. Happy New Year, and see you in 2015! Yes, you can officially sleep in on Thursday. Unless it happens to be Christmas. . . I hope none of you got frostbite taking this photo. We filled up on hot chocolate first so we’d stay warm! Yes, Dave got the last First Commenter Trophy of 2014. Better luck in next year, Andro. And Merry Christmas! Thank you, Andro. I hope you have a good Christmas as well. It was fun being Wombie snowmen! I never thought of rolling down the hill! I’m curious Fraz… Does Wombiclause visit your house instead of the regular guy??? Winky Claus left lots of chocolates for us this year! He looked kinda familiar. He does look kinda familiar. I’m assume that instead of coming down the chimney like the regular guy he burrows up through the floor. I bet he did! I don’t think he’d fit down our chimney. And there did look like there was a hole in the floor! enjoy your break – wishing you and yours all the best for 2015 ! Love the photo, Peter, and sorry I’ve missed many posts…it’s been busy getting ready for the holiday and our trip, especially with our daughter home now…anyway, looking forward to seeing more great cartoons in the new year. Merry Christmas! Thanks, Lauren. We’ve missed you! And a very Merry Christmas to you too. You are also featured in my Christmas post. Well all of you are. Thank you, Sandee! And Merry Christmas to you, too. Merry Christmas Wombies, Peter, guest, and my four Wombies visiting. Merry Christmas, Deb! Your four Wombies are doing fine here. I bet they have a great Christmas! I have all kinds of games and activities planned out for them. I love the Christmas card you made of the Wombies, Peter! Oh, and look how cute Fraz is, but don’t tell him I said he was cute. Thanks, Deb. I won’t tell Fraz what you called him! Merry Christmas Peter and the Wombies! A very happy Christmas to you and all the Wombie clan. I hope the fat man’s sleigh can carry all those wine gums. Fraz, can you fit in your stocking? I think Santa’s sleigh may well reach its limit with his delivery here. Merry Christmas, Red. I can! I wouldn’t want to disappoint Santa with a too small stocking! Merry Christmas to you and the wombies. Happy Holidays, Peter! You too, Wombies! Thanks Doron. I’m glad you had some fun here. I think your chocolate stuffed turkey will attract all the Wombies for miles around. I hope it’s a very big turkey! Love it. Thanks for a great year of cartoons! Here’s wishing you Peter, our blogger friends and most of all the Wonderful Wombies a Merry Christmas and a happy 2015. P.S. Now that the Wombies are snowmen they won’t feel the cold! Thank you Dilip, and Merry Christmas to you, too. Maybe we should all become snow Wombies for the winter!
. . . at least until it melts. Happy holidays, Jason. Wow, that was really neat! Merry Christmas Peter. I love the Snow Wombies! Thanks, Sabina. Merry Christmas and Happy New Year to you too. Just dropping in to leave a wagon full of chocolate for the Wombies. I’m sure they’ll enjoy it! We wouldn’t want to run out, especially with half your gang here. I appreciate you watching them. My gang will be doing most of the watching. Hopefully they won’t get into too much trouble. Happy New year, Peter, and to all of Wombania! Happy New Year, Deb! All the Wombies survived the big party and are doing well. Hey! What happened to my comment? I thought I posted on here…. I checked to see if your comment ended up in the spam folder by mistake, but it wasn’t there. Occasionally comments just seem to evaporate. Thanks, Joseph. I hope you and your family had a good Christmas, too. And Happy New Year! That sounds like a typical Wombie dream! At least it wasn’t a nightmare. Well, as long as the chocolate held out. Happy New Year to a handsome harem of hairy Wombies!! W.C.C. Thanks, Bill. Happy New Year to you, too! Happy New Year, Andro! One must always take care of the important eating tasks first. Yes that’s true but guess what? Oh boy! Thanks, Andro. It is freezing cold here today! I hope you are warmer. A chilly greeting warms me up! Merry Christmas, Novia. I hope you had a nice vacation.